The Garden cabin is set in a lovely garden setting with its own covered deck and outside furniture. It has a nice sunny room with a double bed and a single bed. There is a seperate shared equiped kitchen with dining area and BBQ. There is a seperate shared bathroom and toilet nearby. There is also a large shared geodestic dome to use as an extra living area nearby. A fish cleaning area is supplied. 10min walk to the beach and 15min walk to the Okupu Wharf which is good for fisihing from. Dome Cabin is sunny and private with 2 bedrooms ,12 volt solar lighting and an outside deck with furniture. The power system is solar,also 240AC for charging Phones etc, there is also plenty of nice spring water. 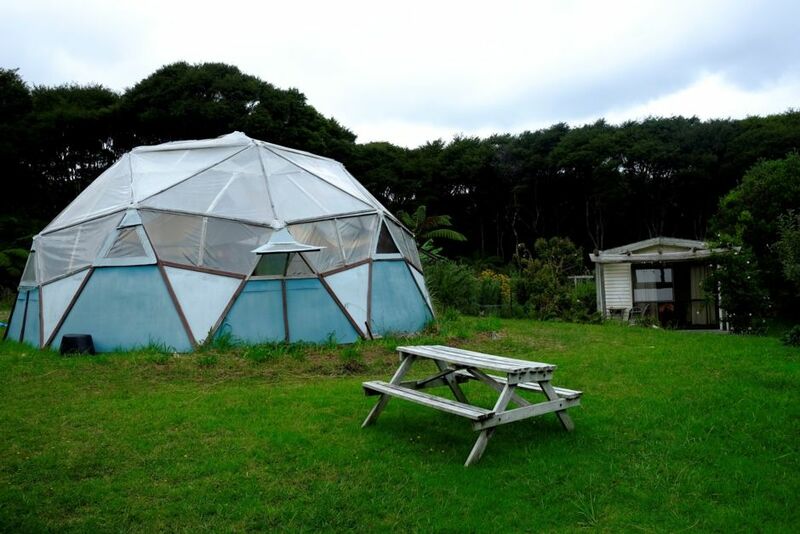 A large Geodesic Dome is available for extra living space near by. The bathroom is separate with 2 toilets, 2 showers, and seperate equiped kitchen and dining area with covered outdoor deck, BBQ and furniture. All is situated very close by with a nice lawn for extra camping. There is an Organic veggie garden near by and hens for eggs,please ask if you require these,as only seasonally available to buy.